Nothing to say, other than I am psyched for the Roaring Lion - Cracksman showdown. We have to 'un-psych" ourselves; there will not be a showdown between Cracksman and Roaring Lion. Can't argue with Gosden's reasoning. The QEII should still be a good race, as Roaring Lion will have to face horses like Beat the Bank, Lightning Spear, Recoletos and good fillies Happily and Laurens. Roaring Lion narrowly wins the QEII over I Can Fly. Cracksman’s swan song is up next. I hope he goes out a winner. Roaring Lion won the QEII, and John Gosden intimated that the horse may be off to stud now. I can't really blame the owners, as the horse captured 4 of Europe's top contests this year, and this would be a great note to sign off on. But it would be thrilling if he made the trip to Churchill. The Bloodhorse article about Roaring Lion going to the QEII mentioned that they've been dealing with Lion's studdish "I like the ladies" attitude for a while. Pretty sure I've seen that about Cracksman as well. Sometimes when mares get baby fever it's better to retire them, and it can happen to the boys as well. Last edited by Mylute on Sat Oct 20, 2018 11:09 am, edited 1 time in total. In Sheikh Fahad's post race interview, he said he hasn't ruled the Breeder's Cup out for Roaring Lion yet. Fingers crossed! Back to his old self, a great end to his career. What a shame we never got to see Enable vs. Cracksman. Wonder which one Frankie would have chosen to ride? Kudos to Subway Dancer who ran a very credible 3rd in the Champion Stakes for the Czech Republic! And whilst not the most impressive victory, I'd like to give credit to Stradivarius and his team. 5 wins in a row this season, undefeated winning the $1 million stayers bonus and now the Long Distance Cup to cap off an incredible season for him! 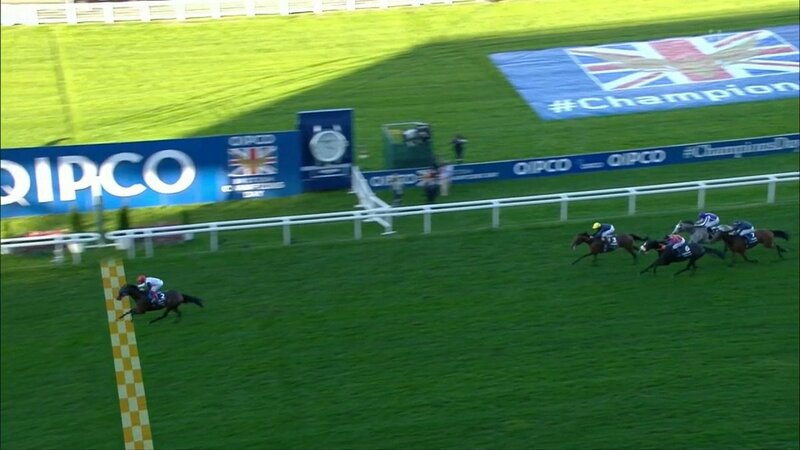 What a great run by Cracksman!!! I wonder if he gets 130+ with his final performance. It looked like Happily was rearing/flailing and may have knocked herself against the gate sides pretty hard. The starters backed her out and then immediately sent the field on its way, so they didn't even bother to take time with a vet exam before the scratching. Regarding Roaring Lion...that was a very brave win by the big grey colt. He really had to hang tough to keep his nose in front. A race like that can take a lot out of a horse, so I wouldn't be surprised if Gosden ends up deciding that shipping across The Pond for a big race in just two weeks might be a bit much for RL. Wonderful win by Cracksman. Looked like the racehorse 'light' went back on in his stallion brain, as he ran like he did last year. Where is he headed to stud now? "Where Anthony Oppenheimer's four-year-old will begin stallion duties remains unclear..."
That's the British way of dealing with horses that delay the start, whether they're unruly in the gate or simply refuse to load. Little patience for any of it and no unloading of stalls after the late withdrawal to give fans a chance to restructure their bets, just, as you saw, back the horse away and send the field off immediately. The safety and patience of the horses already standing in the gate > fans restructuring their bets. That's just this fan's opinion, though I'm not really much of a gambler.